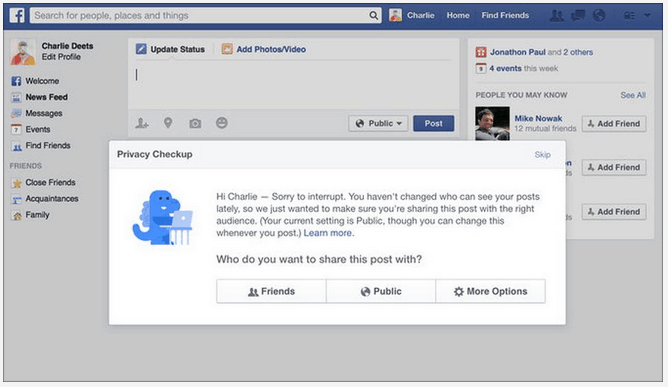 In order to help users better manage sharing their information and postings Facebook has started rolling out its ‘privacy checkup’. The plan however was first announced in June in response to privacy concerns and criticism over its data mining practices for marketing purposes. According to this new system a blue dinosaur will be guiding users through its maze of privacy settings for personal information and for sharing their posts. The dinosaur will pop up when users log on to Facebook, and take them through each step of the privacy settings, from their personal information to the apps that may access Facebook data. “We know you come to Facebook to connect with friends, not with us,” Facebook’s Paddy Underwood said in a blog post. “But we also know how important it is to be in control of what you share and who you share with,” he added. A privacy shortcut has also been introduced by Facebook on its each page enabling users to update their privacy settings. The social networking giant with more than a billion members worldwide has been subject to lawsuits claiming it fails to protect users’ personal data from marketers and third-party apps. Facebook has also agreed with a US government agency to submit to external audits of how well it guards users’ data.